My father started primary school at the White Only Alberton Primary school. The school was two roads down into the valley, in the alluvial plain of the Natalspruit, 5 avenues from the Union Cafe. He started school as an immigrant’s son. The school has had a colourful record after educating the white youth of a conservative town in South Africa. In the sixties it became the town prison, mostly full of blacks who had broken the Pass Law, or were caught in the streets after the 9 p.m. curfew. After that the prisons were centralised in the bigger cities and the jail became the police headquarters and has remained that into South Africa’s democratic age. The school was almost Cape Dutch style. It did not have the gables. It was white with simple white columns at the front veranda which was the entrance to the administrative offices. The classes were in two wings on either end of the administrative building enclosed a dusty courtyard which was the playground. There was no green grass, much like one of the poorer township schools today. The verandas of the classrooms had simple wooden poles supporting the corrugated tin roof. The floors were cement polished red with Cobra polish. Each day the dust on the children’s shoes would scuff the floor until the next week when it was polished again. My father was born in 1937 on 1 September, Spring Day in the Southern Hemisphere. He started primary school in 1943. He was the pride and joy of my grandparents John and Marigo. I can imagine them buying his uniform and preparing a satchel with notebooks and pens and pencils from the shop for him. It was my grandfather’s vision that had afforded his first born son an opportunity to be educated. In the village in Greece after World War tow a civil war consumed the nation in the years my father would have been a primary school. He would have witness atrocities of Royalist brothers against Communist fathers. He might not have made in further than primary school and might never have gone to high school in Tripolis. For in Greece in those years there was apartheid that the town folk were aloof to the starving villagers. That was one of the reasons my grandfather was in South Africa. My father started his first year at an English medium school and was only able to speak Greek. Greek was the language spoken at home and the children were not really allowed to have friends with the foreigners. As proud as his parents were of him attending school in a neat uniform they must have been scared they would lose him to the new culture. He failed that first year at school and had to repeat it when he knew more English. But he never failed my grandparents in a more important way. He never failed to keep his culture alive: he built Greek halls, churches and schools. 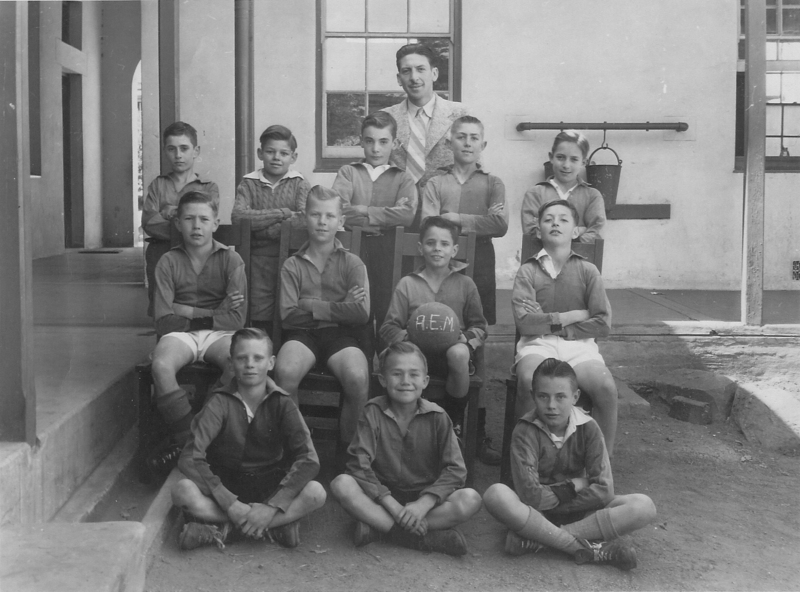 Alberton English Medium Primary School Soccer Team 1947: My father at Mr Gouws' right shoulder.